When my father ran Ramona Park, he used to sit on a ticket taker stool to admit dance patrons. 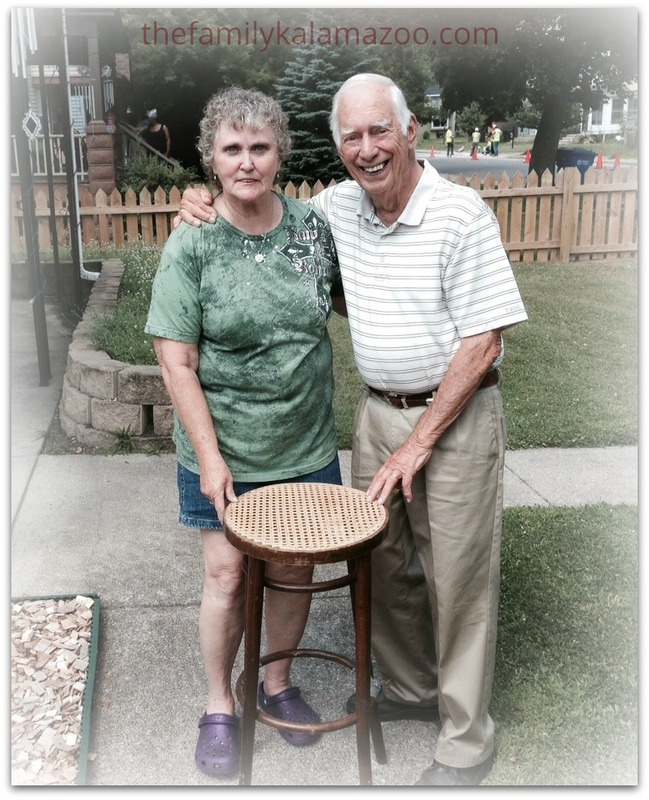 He still had the stool until recently. The other day, he gave it to Paula Taylor, who is writing a history of Ramona and Long Lake. Vicksburg never included Ramona Park, which was at Long Lake. However, at that time Portage as a town was much smaller than Vicksburg, so it would have been the closest “big” town. Also, the Grand Rapids & Indiana Railroad had a flag stop at Ramona Park, and their closest depot was in Vicksburg. Wow. Nice to know people are watching & reading what you’re putting in your blog. How cool. People have been so amazing in their responses. Bloggers who know nothing of Kalamazoo have helped identity photos and given me leads on sources, etc. Readers from or familiar with the Kalamazoo area or my family have been an unending source of information. I am so thrilled and humbled by the experience of interacting with people who know so much and are so helpful. Yes, I think it’s amazing how many mysteries you’ve discovered and solved in your research and writing. 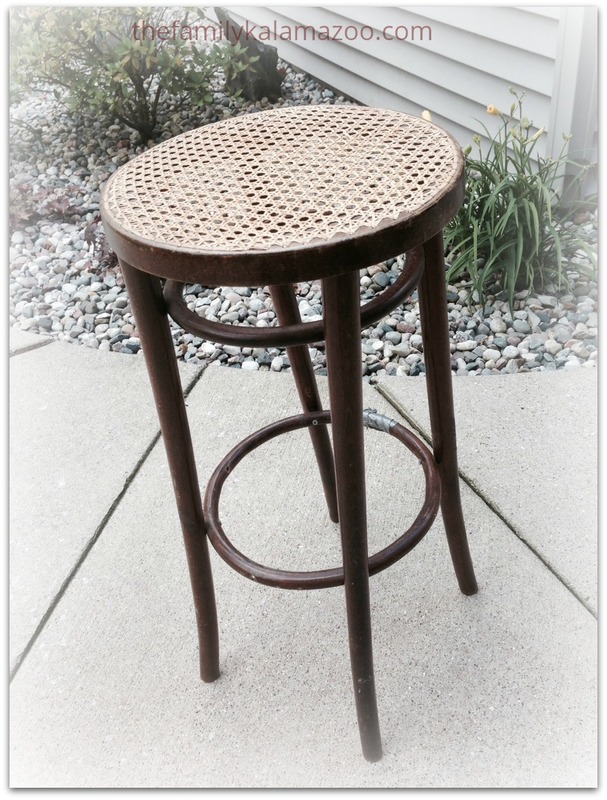 And I love, love, love, that your father’s stool is going to someone who can appreciate it for the times it represents. Very interesting pictures, as always. Oh, that must have been so tough to let go of them. Did they go to people who care about them? Sheila, I’m thrilled that Paula has the stool. She has such deep knowledge and passion for the subject of Ramona and Long Lake, that I know it’s in good hands. I don’t know why I never responded here before. I’m so glad you got to meet my father, Paula. Maybe someone wrote the caption on the photo long after it was taken, and they were just making a “best guess” as to what the picture showed. I often put names on old pictures I find–and sometimes I’m not positive who the people are, but it’s my best guess (and I don’t think that anyone else would have any better knowledge than me). I try to indicate that I added the names many years later, so that others coming along after me can take my opinions with a grain of salt if it seems appropriate to do so. I don’t know why I never responded here. I just saw this comment now. I haven’t been around too much lately, Sheryl. Are you having fun with your new blog? This was a really good photo of your Dad, Luanne. He has a genuine smile. Wish I had known him since he was one of the best around. You can just tell. . .
Ah, thanks, Robin. He was a very complicated person and not perfect, but he was a people person and so much fun. And, yes, he had a great smile!!! Luanne, the closet depot for the train that stopped at Ramona Park was on Portage Road, about a mile from Long Lake give or take, just off Zylman road, Vicksburg was not the biggest town, Kalamazoo was where Ramona Park was and my address back then was RR# 3 Kalamazoo, Michigan Long Lake, Portage never became a City til December of 1963, I graduated from Portage Township school in 1963, but since I graduated in June I am from the “old” school, once Portage became a city, there were so many kids that Portage built a new high school on the west side of Portage and so my school Portage Township high school became Portage Central, and is still that today. Vicksburg was never a big town back when I was a kid and all the way through my high school years, Vicksburg was a one light town, back in 1966, and I don’t think there’s more than four or five lights in the city of Vicksburg today.